The Lost Girl by R. L. Stein. A Fear Street Novel. The Lost Girl isn't for anyone under the age of 9 because the book has some disturbing content. This book would make a good ghost story, but not a read aloud since the book is long. The vocabulary is for advanced readers. The main character and the supplementary characters really tie the story together, and I was led to really like the character that turned out to be the killer. This story creates a lot of suspense and kept me scared for almost the whole book. There are no pictures in the book but the story is still clear. The Lost Girl has well developed ideas, like the main plot twist. The characters are different from many other books I've read because they are actually breaking the law. I've actually never read a scary book like this before, and I loved it! We would like to thank St. Martin's Griffin for providing a copy of The Lost Girl for this review. 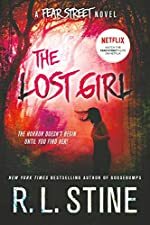 Have you read The Lost Girl? How would you rate it?